So I finally received my prize from DJ Techtools! 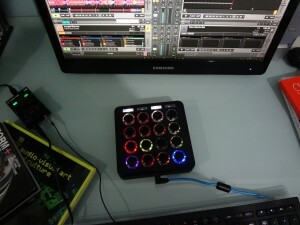 And its an AMAZING controller, the MIDI Fighter 3D. A 4×4 RGB arcade button controller, with 4 banks, 6 side buttons and very responsive tilt sensor and compass! 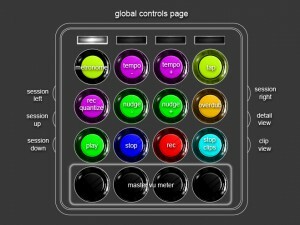 Literally packed with different MIDI messages for the most expressive controllerism! I’m so excited about it that I decided to port my MF Pro Ableton script for this guy. All I had to do was implement the correct LED feedback messages, re arrange some button assignments and implement the tempo blink and master VU meter. Here is a beautiful live performance from Rheyne featuring the script. 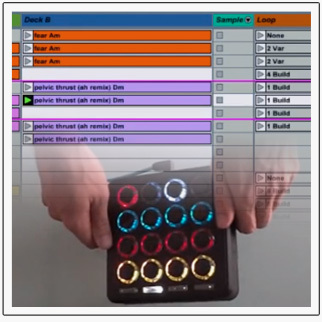 It also got featured at the DJ Tech Tools website! The mapping consits of 4 pages. 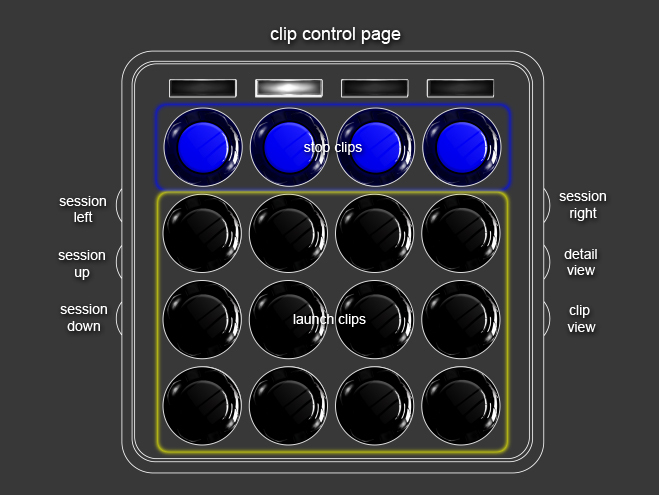 Page 2: is the Clip control page, you have a 4×3 grid and the top row is the stop button for each track. 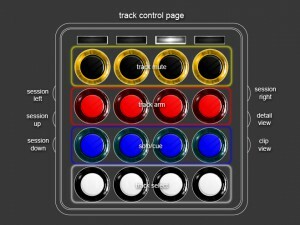 Page 3: is the Track control page. Each row corresponds to one of the rows inside of the red box. 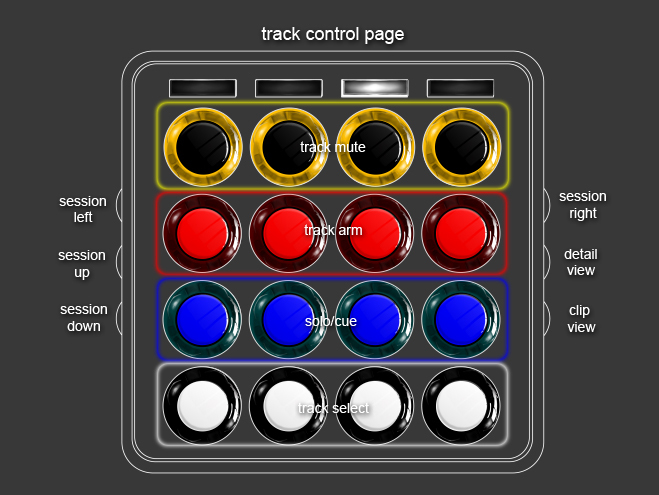 And it consits of Track select, Mut, Arm and Solo. 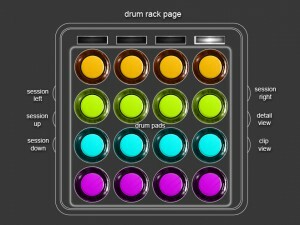 Page 4: is the Drum Rack page. It plays the highlighted 4×4 grid in the drum rack. Make sure that the drum track is Armed and the Track input is On in the Midi preferences page. Also the tilt Left|Right|Front|Back messages get automatically mapped to the first effect device of the selected track. A lot of this code was inspired by and “borrowed” from Hanz Petrov, Will Marshall and the Livid Framework. Without them this wouldn’t exist. Amazing script, huge props! 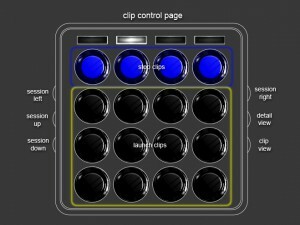 I was wondering if you could give the values to change to switch out the clip stop buttons for clips? Python doesn’t look too scary to edit and I need to learn anyways so I’d appreciate your help! Bump! I really need your advice on this! Hi I’m actually winokrg on a MaxForLive device that allows to sync, link or map a lot of things in Ableton Live to almost everything in Modul8.I’m not a VJ and I’m doing that just for the fun of learning programming, but I think it will be a fun device, pretty usefull.It’s a really simple console. With 4 mouse click you link what you want. It works with the OSC-global module.Would you like to try it and give me your comments about the bugs and missing features ?Have a good day. hey! sorry i was backpacking across Europe! and lol, i don’t want any money for this. Here is a quick edit that should give you a 4×4 grid instead. First off, awesome script man! Have had my 3D now for a few months and love the thing. Was primarily using it to control beat choppers and fx for my drums, however my newly arrived QuNeo has gotten here now. So that took over that role (once more people get there hands on it going to be some amazing scripts for it too). Anyways, noticed one bug in yours. When you say are in the forth bank for the drumpads, switch back to the global bank and hit any button there it triggers a midi note to any armed track. The other thing I have to say is that I too would love to change a couple things as well. I will take a look at the script though and see what I can figure out. Some of the scripts for controllers are insane, like the LPC script for the launchpad and the Maschine Advanced script for NI Maschine. LPC has some amazing modes and the stock script for the QuNeo shows some promise. You should check the QuNeo out if you havent already. Thanks for your interest! Yup I should definitely get my hands on one of those soon! You can easily modify the basic mapping values in the MIDI_Map.py file. But of course there some insanely complex scripts, this one is fairly basic! Feel free to modify whatever you want, and if you have any questions about that let me know. Also as for the bug, actually its not really a bug, as the input for the 4 VU meter buttons in the first page are not actually mapped anywhere. If you manually map them somewhere ( the Note on message, not the CC ) then it will not send the notes to the armed track. Great script. What would I have to remove to only have only the tempo increase/decrease controls and nothing else mapped via script?